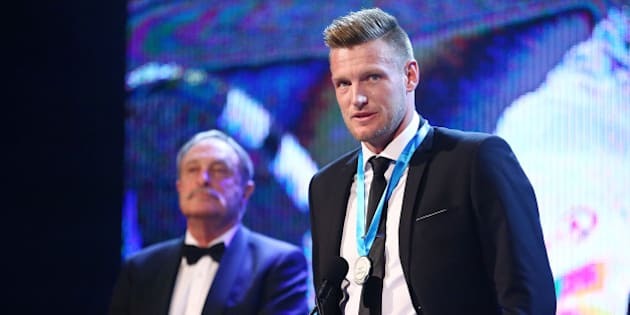 Sam Groth has been awarded the 2015 John Newcombe Medal at a gala event on Monday night in Melbourne. The top prize in Australian tennis was presented to the 28 year old veteran by the man himself -- John Newcombe. In what was deemed as a "shock" result by many pundits (who were perhaps looking for the kinder word 'unexpected'), the award ends Groth's best year yet having played a major role in Australia's path to the Davis Cup semi-finals and become a favorite with Australian tennis fans. While Groth is no doubt a worthy winner, the strongest contender in the lead up to the event has been Dylan Alcott -- the inspirational wheelchair tennis player who this year secured the world number one ranking by winning both the Australian Open and U.S. Open wheelchair titles -- and now must be wondering what he has to do to receive the recognition of his peers and the public. Unfortunately for Alcott, Groth's win is perhaps best viewed in the light of the new added criteria for the award -- that of 'best ambassador' -- when paired with the poor behaviour of two of Australia's top male tennis stars. In a year that has seen Australian tennis weather some shameful behaviour from its younger and brighter lights, Groth stands out as everything Tennis Australia would be hoping to promote as the face and culture of Australian tennis. Neither Bernard Tomic or Nick Kyrgios were nominated for the award due to their transgressions of the past year. But in a year when the state of tennis culture at the elite level in Australia has been called into question with much public in-fighting and acrimony, it would seem that those in charge both administratively and culturally have a point to make. It could be viewed that Groth's ambassadorial performance when added to his on-court performances is what has secured him this honour -- which is as it perhaps should be and is very definitely the point Tennis Australia and the senior members of the Australian tennis fraternity would be making to the young Princes and prodigies in the 'family'.